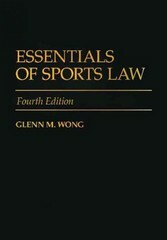 Essentials of Sports Law 4 Edition In this thoroughly revised Fourth Edition, Glenn Wong provides a comprehensive review of the various sports law issues facing professional, intercollegiate, Olympic, high school, youth, and adult recreational sports. Major topics include tort liability, contracts/waivers, antitrust law, labor law, constitutional law, gender discrimination, drug testing, intellectual property law, broadcasting laws pertaining to sports agents, business and employment law, Internet gambling, and athletes with disabilities. Significant additions here include new court decisions, agreements (contracts and collective bargaining agreements), and legislation (federal, state, association, and institutional rules and regulations). Discussions of legal concepts are supplemented with summaries and excerpts from hundreds of actual sports cases. Wong cites a variety of books, law review articles, newspaper articles, and Web links for those requiring further information on particular topics. This text-professional guide serves as an invaluable resource to those involved, or studying to become involved, in the vast industry of sports.